Home > News Articles > Charity President speaks out! Government called upon to ring-fence allocated funding and recognise positive benefits of holidays for families. In a speech given to the Holidays Matter conference at World Travel Market in London, Peter Long spoke of the millions of children and parents who could not afford a break each year and called for the Government to assess public spending to help those people. Peter Long, Chief Executive of TUI Travel PLC, one of the world’s leading leisure travel companies, and President of the Family Holiday Association, has urged the Government to do more to support breaks for hardworking struggling families. “As the Prime Minister rightly said recently, the Government should do everything possible to support and strengthen family life in Britain today. Therefore every government department will be held to account for the impact their policies have on families. Whoever assumes power after the forthcoming election. I urge the following to happen: all the £500 million currently allocated by central government for family breaks must be ring-fenced and not diverted by local authorities, and the Government must have a greater understanding and appreciation of the positive impact a simple break can have on family life. Over the last 12 months, the Family Holiday Association has seen a 21 percent increase in fundraising income and strengthened links with some significant corporate supporters. These range from First Great Western to Bourne Leisure, from Canvas Holidays to the staff and customers of TUI Travel. An Ambassadors’ programme was also successfully launched, aimed at mobilising greater support from all leaders in the travel industry. 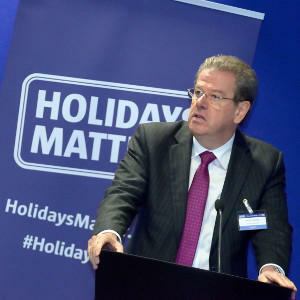 Today, Peter urged people to join the Holidays Matter network “Holidays Matter is an initiative that drives right to the heart of what we’re all trying to achieve. It’s a commitment to the fundamental principle that every single person in this country, adult and child, should have the opportunity for a break away from home.